Eschenbach carries both a frame for clip-on lenses and clip-on systems. Frames for clip-on lenses are lightweight and can be comfortably worn over eye-wear. 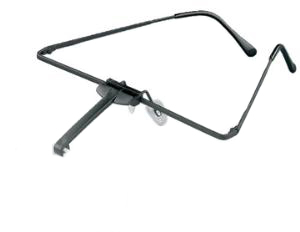 The metal frames have a black matte finish and provide an unrestricted field of view. The lens positioning can be easily adjusted using the quick snap closure. The lens clip element is made of glass fiber-reinforced plastic. Clip-on lens system are designed to provide spectacle wearers with the option of hands-free magnification. Our systems are lightweight and fit most eyeglass frames. The lens is set 2 inches from the eye, allowing for a more comfortable working distance. When the lens is not needed, it can be flipped up out of the way. The lens material is PXM lightweight lens with cera-tec® coating to protect it from scratches. There are also four rubber tips for the clamps to protect the spectacle lenses. Clip-on lens comes with a limited 1 year warranty against defects in materials and/or workmanship. If the product fails under the limited warranty product policy, the product will be repaired or replaced at Eschenbach’s option. All Eschenbach products come with a 30 day evaluation period.